Welcome to the hottest day of the year so far and a perfect day for a walk in the woods! The coppice woodland looked absolutely beautiful today bathed in sunlight which streamed through the open canopy where many of the broadleaved trees have yet to come into leaf. One of the most welcome sights was a glimpse of bluebells (Hyacinthoides non-scripta) flowering amid the wood anemones on the woodland floor. 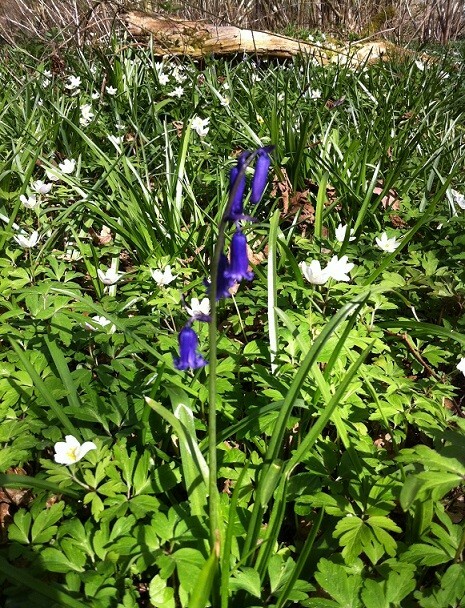 While the leaves have been carpeting the ground within the wood since week 1, this is the first sight of the beautiful bell shaped flowers from which the bluebell takes its name. Most bluebells are found in ancient woodland where the rich habitat supports a wide range of species. In the past, bluebells have been employed for a whole host of uses. During the bronze age, bluebell glue was used to attach feathers to arrows and the Victorians used the starch from crushed bluebells to stiffen collars and sleeves. Bees can also steal nectar from bluebells by biting a hole in the bottom of the bell and reaching the nectar without pollinating the flower. 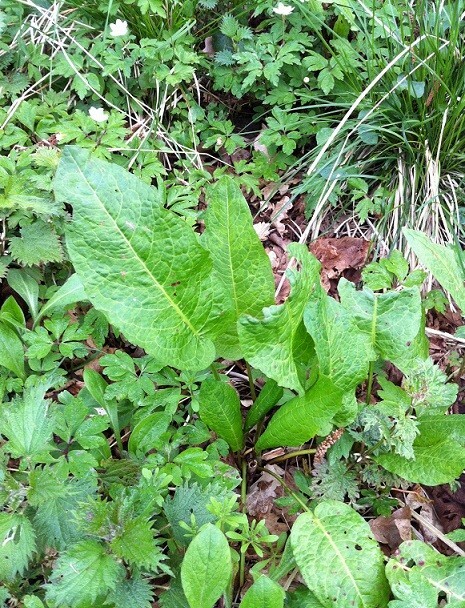 Also visible on the woodland floor is common dock (Rumex obtusifolius). Dock flowers from June to October, so at the moment it is only the spring flush of green growth that can be seen. The main flushes of emergence of dock are March-April and July-October. The hazel catkins which were golden and open to distribute their pollen only a few weeks ago have now fulfilled their purpose and are coming to the end of their life. 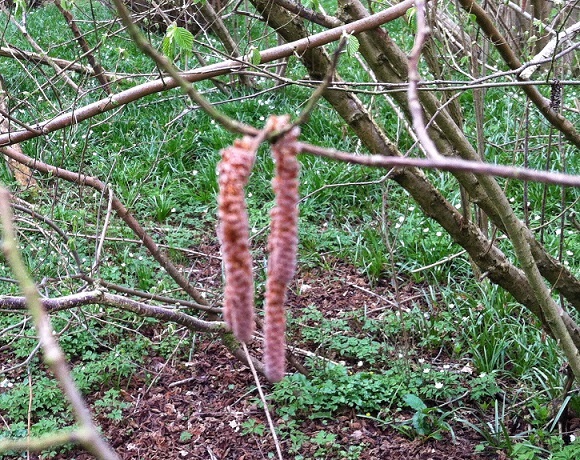 In the last few weeks, the pollen grains released by the catkins have been distributed by the wind. When they land on the female flowers a fine tube carries the male nucleus to fertilise the egg and produce the hazel nuts we see in autumn. And lets not forget the bramble. 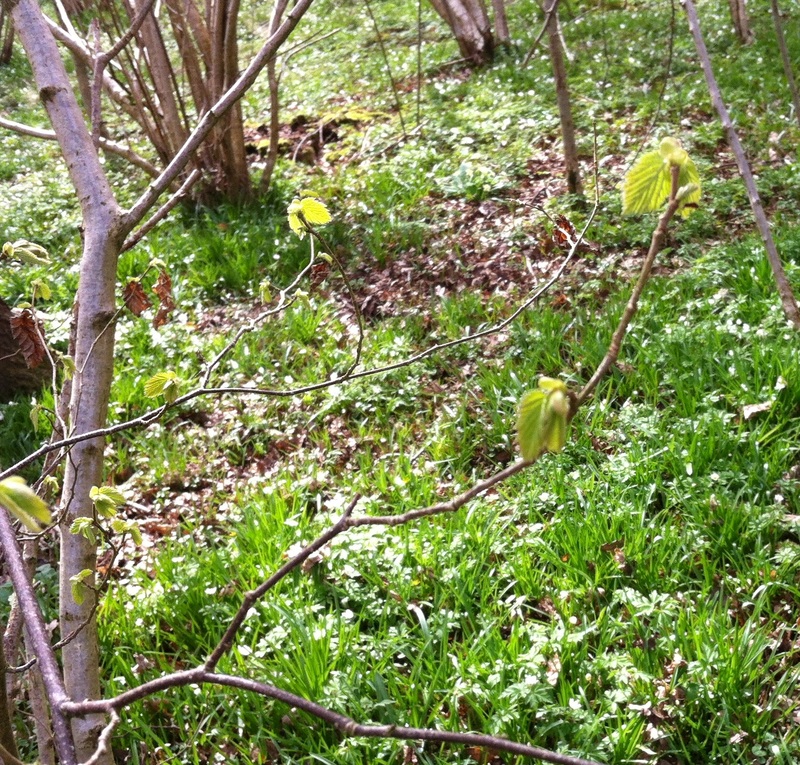 Although the thorny stems from last year are still scattered across the woodland, only now are the new fresh leaves coming out. There are over 1000 known species of bramble worldwide and they provide a wealth of food for birds and animals in autumn…Including humans who will enjoy blackberry picking here later in the year. And that’s it for another week! Join us next week to see what changes are happening in the woods this spring! Send us your own pictures to office@tree-creeper.com or upload them to our Treecreeper Arborists Ltd facebook page. It’s all starting to happen in the woods now. With the warmer weather drifting in, albeit in fits and starts, everything seems to finally be trusting that it is safe to come out of hibernation. 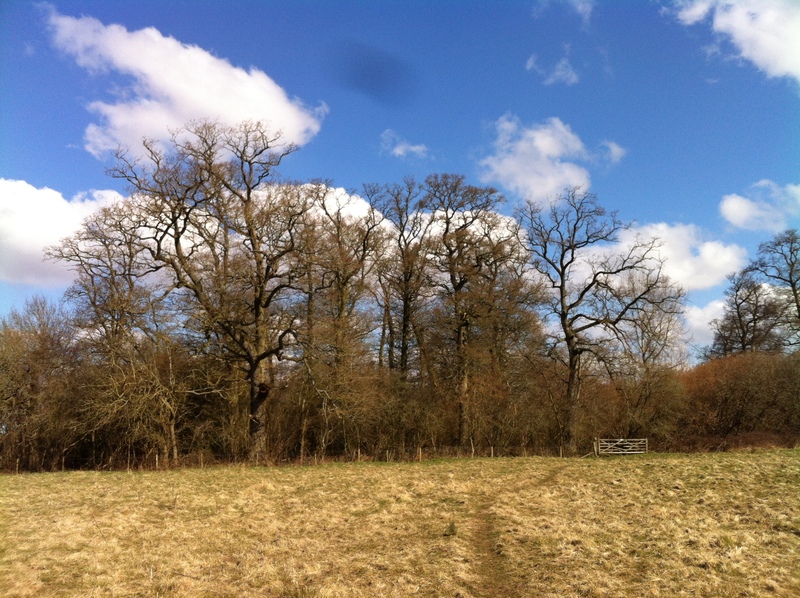 This week, everything seemed to be bursting into life, wherever I looked there were signs of spring and listening to the birds singing in the trees and hedgerows passed a beautiful half hour wandering around the woods. 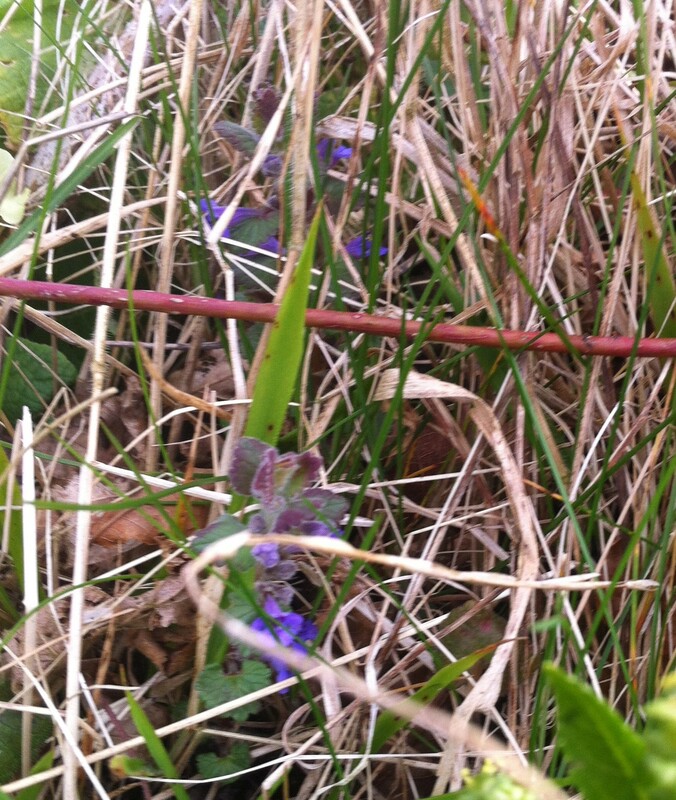 One of the first new plants I noticed on entering the woods was self heal (Prunella vulgaris) starting to flower around the edges of the woodland in the grassy ecotone. Self-heals are low-growing plants, and thrive in moist wasteland and grass, spreading rapidly to cover the ground. They are members of the mint family and have the square stem common to mints. They flower from late spring through to autumn and add another touch of colour to the ground as you enter the woodland. Up until today the majority of the trees and lower level canopy remained stubbornly in bud with only the young elder leaves brave enough to emerge. 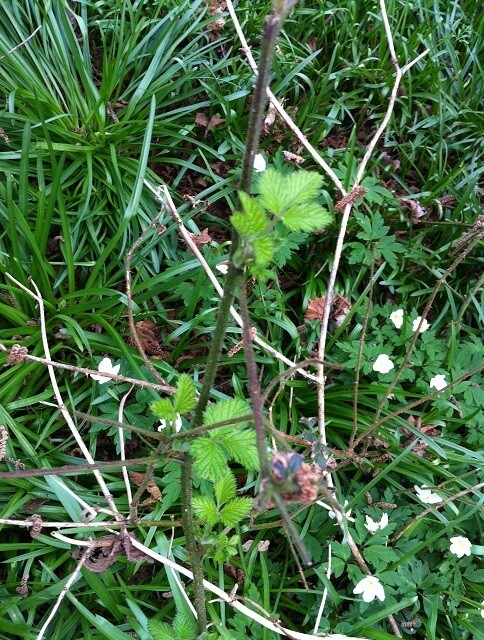 It was good to see the hazel buds bursting into life, showering the woodland at eye level with bright green emerging leaves. 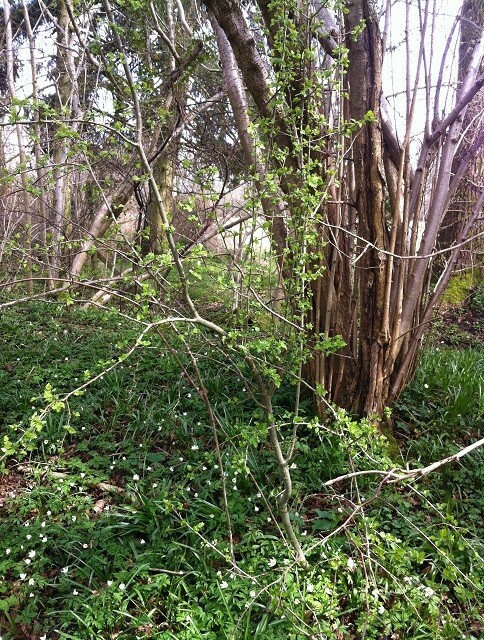 Most of this woodland is comprised of coppiced hazel (Corylus avellana) and in the past hazel has been crucially important as a source of wood which grows into straight poles when cut at ground level (coppiced). Uses include thatching spars, net stakes, water divining sticks, hurdles, furniture, firewood and many many more. Hazel nuts were prized as a food source in the past, however grey squirrels often strip the trees before the nuts can ripen and be harvested. 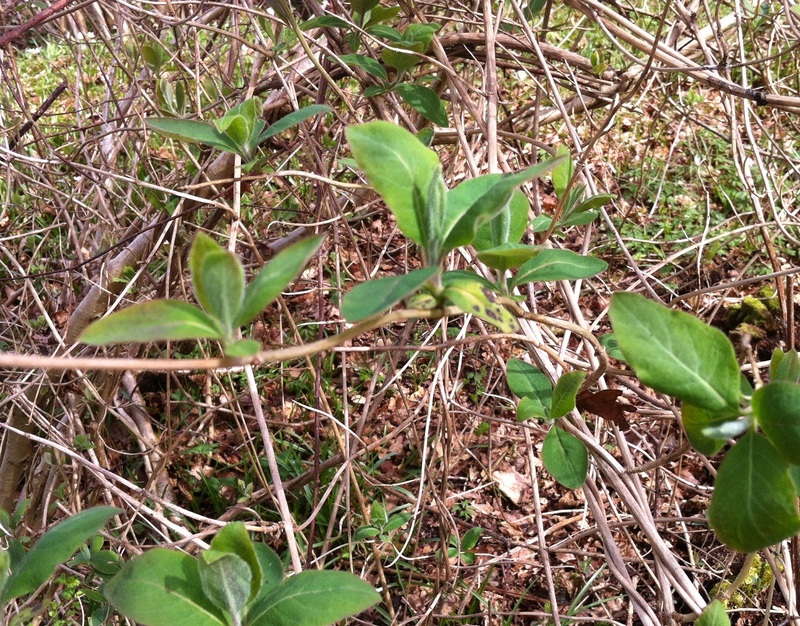 Also starting to come into leaf is the common English wild honeysuckle (Lonicera periclymentum). I was glad to see honeysuckle in the woodland as it is an important plant for dormouse habitat. Dormice shred honeysuckle bark and weave it into a ball to form their nests and although I have yet to spot signs of dormice in this coppice woodland, it is good that it has potential as dormouse habitat. The elder (Sambucus nigra) is certainly the most advanced tree/shrub in the woodland in terms of leaf development now. Also part of the honeysuckle family, elder provides a wealth of flowers and fruit throughout the year feeding a wide range of birds, animals and insects. 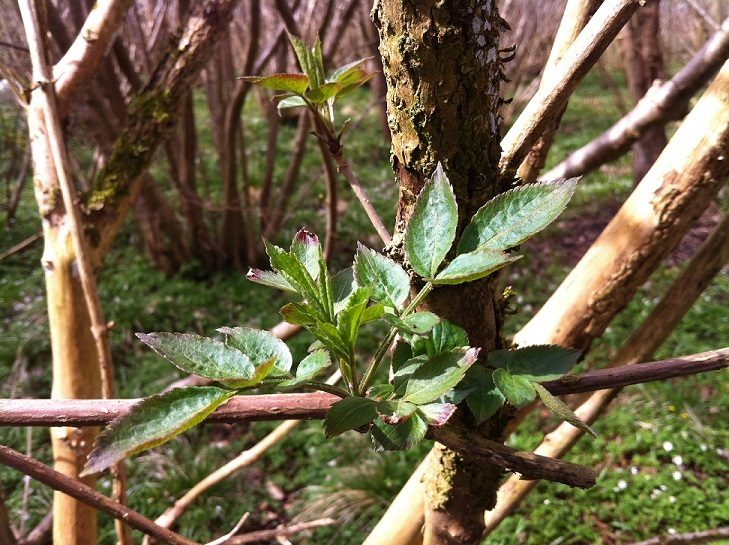 And its not just the hazel and elder bursting into leaf, there are a lot of young hawthorn plants making up the shrub layer of the woodland and their bright young leaves are also starting to emerge. That’s it for this week. Join us again for a walk in the woods and see what you see on your own walks. Let us know at http://www.tree-creeper.com or send us your photos on our Treecreeper Arborists facebook page. Another week, another walk in the woods and thankfully there’s no denying that spring is finally here! The weather is warmer, the buds are starting to burst, the spring flowers are starting to agree that it is time to come out. After a long, cold and particularly dreary winter, it is wonderful to watch the woodland coming alive again with the signs of spring. This week, I spent a lot of time looking at the many pieces of deadwood scattered around the woodland. All too often, woodlands and gardens are ‘tidied up’. Deadwood is looked upon as something to be removed. In some cases, removal is necessary to ensure safety however, when it is safe to do so, deadwood should be maintained as vital habitat. Removing or burning rotting timber can destroy valuable invertebrate habitat. 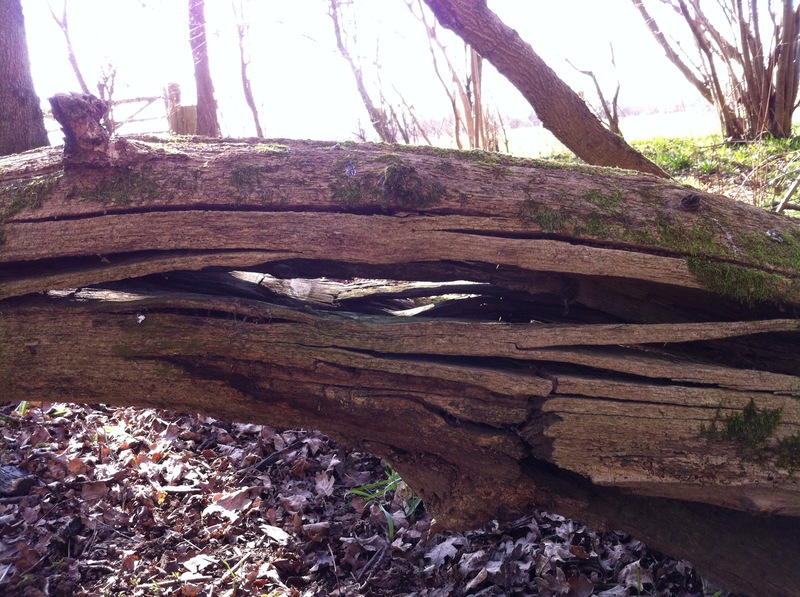 Wherever possible, fallen, rotting wood should be left undisturbed where it falls. Fallen branches and other lying deadwood should be maintained in situ unless they pose a danger to the public. This woodland is full of both lying and standing deadwood and while it may look untidy, it is important to remember that nature is rarely “tidy”. Often the best habitats are found in areas that humans, with our inclination to impose order on our environment, leave unmanaged. The same flowers could be seen dotted around the woodland floor as in previous weeks, however there were noticeably more of them this week. Primroses and wood anemones blanket patches of the woodland floor and the brilliant green of the bluebell leaves shone in the bright sunlight. For this walk, I decided to take the left hand circular path to make a change from the other routes I have taken and came across these rabbit holes. Out of interest, I loosely crossed some sticks over the entrance to the holes to find out whether they were in use. 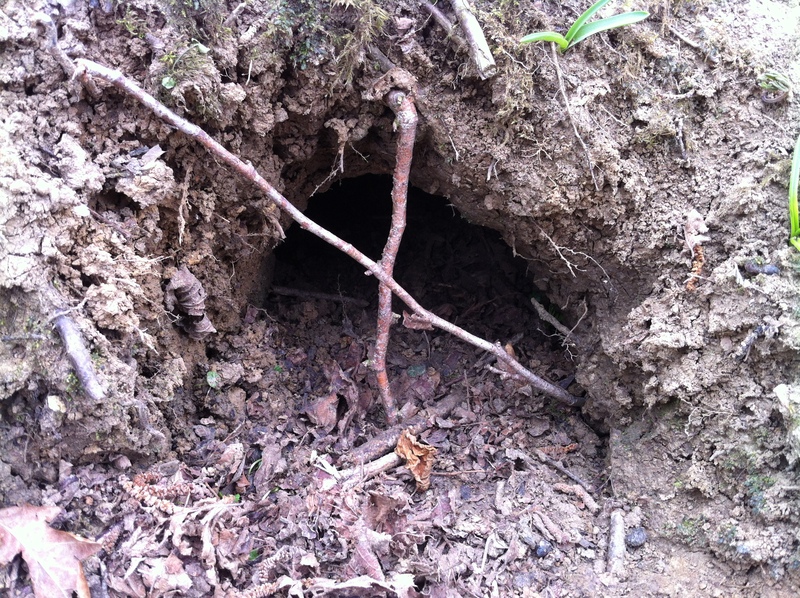 Sure enough, the following day when i went back to check, the sticks had been pushed aside and fresh rabbit droppings were observed around the area. 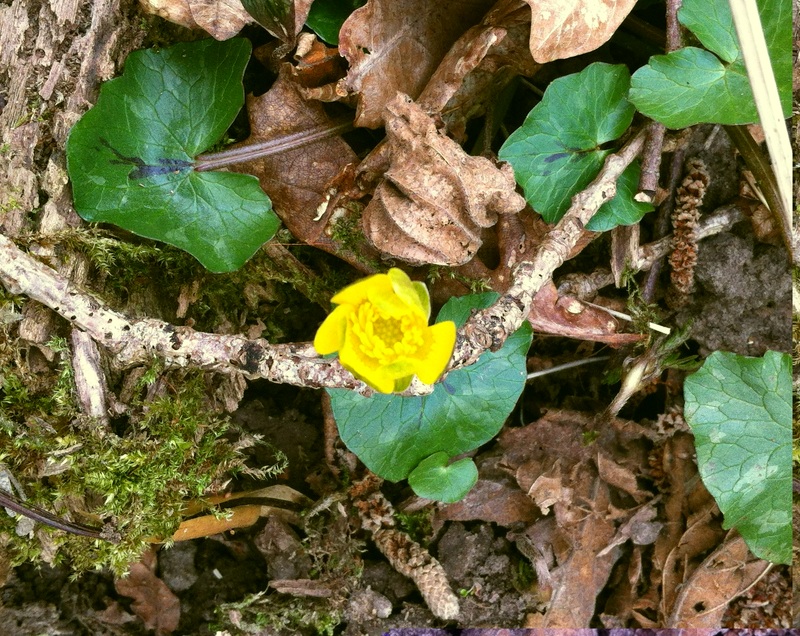 Joining the splashes of spring colour on the woodland floor are the lesser celandines (Ranunculus ficaria) which have now started to make an appearance. A perennial member of the buttercup family, these native British flowers are widespread in woods, hedgerows and on the banks of streams. Join us next week for another walk in the woods. Until then, send us your pictures of your spring walks in the woods to office@tree-creeper.com or post them on our facebook page. I really don’t know where last week disappeared to! I walked through the woods on a beautiful Tuesday last week and then the rest of the week flew by in a whirlwind of work! So, here we are, apologies for the slightly late posting of this entry…Lets go for a walk! The trees and plants are as confused by the weather as we all are at the moment! Every week the weather could quite easily be doing anything at all, from brilliant sunshine to snow this really has been a spring of extremes! 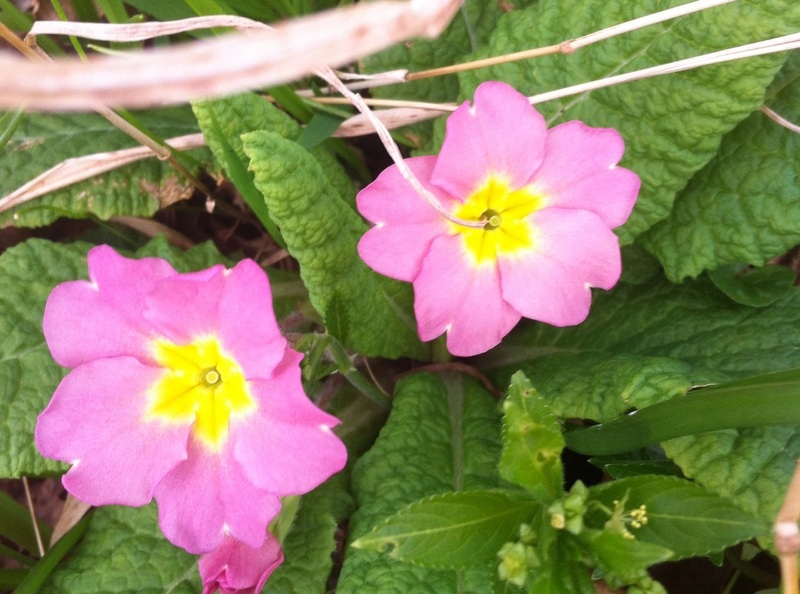 Fortunately, last Tuesday was a beautiful spring day and it was wonderful to see the signs of spring in the sunshine. 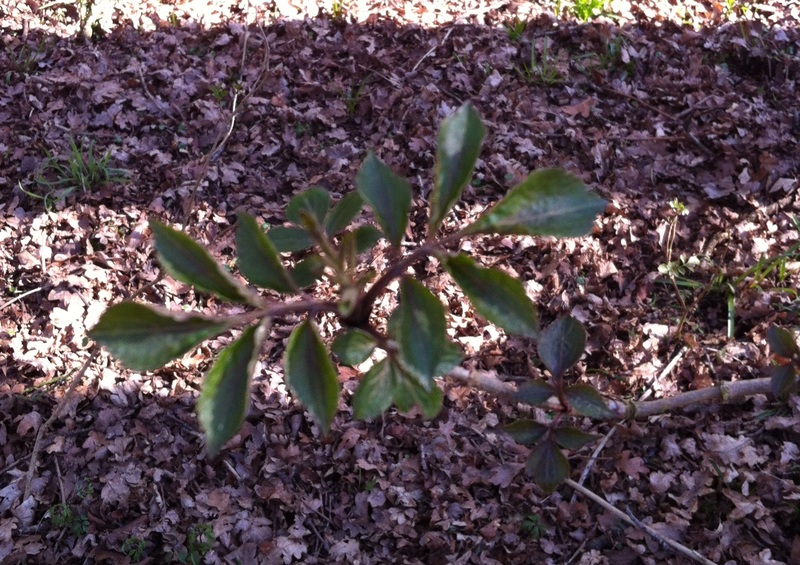 Many of the tree buds are still remaining resolutely closed against the cold weather, but a few of the species in the woodland are starting to show signs of emerging leaves. One of the most advanced species in this woodland is the elder (Sambucus nigra), which is by far the furthest along in terms of bud burst. Looking around the woodland floor the nettles are starting to emerge in patches. 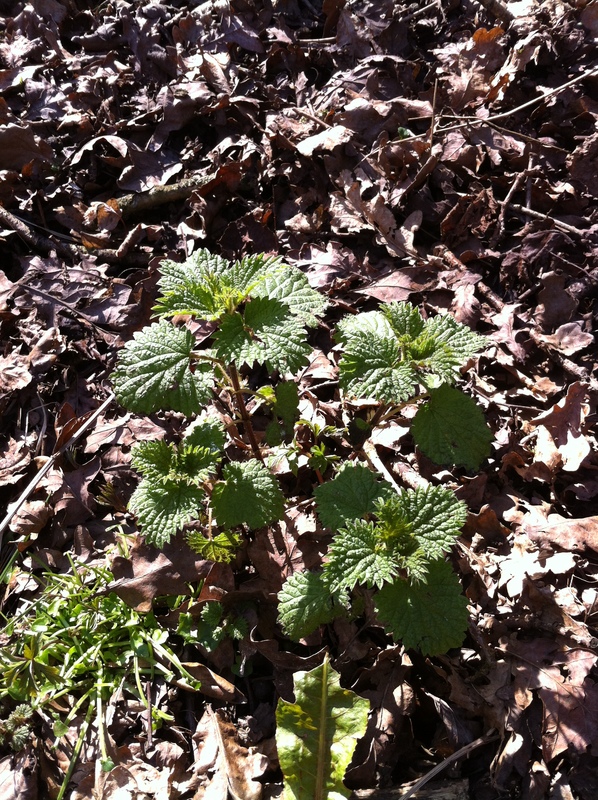 The common nettle (Urtica dioica) prefers moist fertile soil that has a deep layer of composting detritus therefore the woodland floor with its thick layer of decomposing leaf litter is the perfect habitat for these plants. A couple of weeks ago, we saw a lot of evidence of squirrel activity in the form of hazel nut shells characteristically split in two. Again, there was a wealth of feeding evidence littering the woodland floor, this one tree stump was covered in discarded shells. 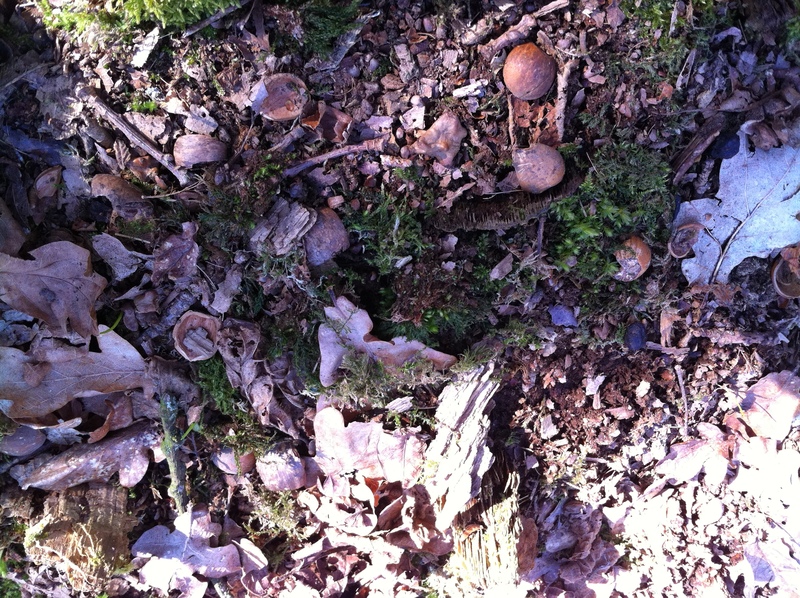 However, these shells are not the only indicators of grey squirrel presence. 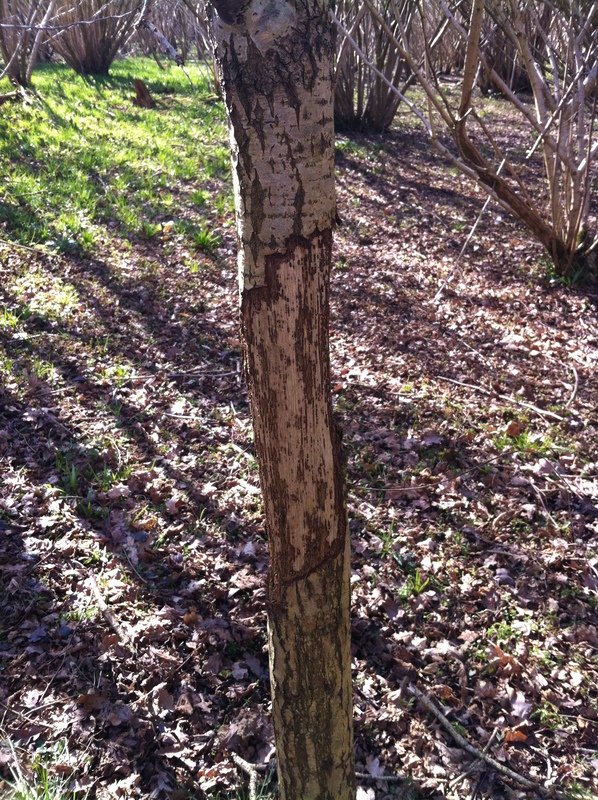 Many of the trees are showing signs of squirrel damage. Grey squirrels gnaw at the stems of trees to get to the sweet sap-filled layers just beneath the bark. 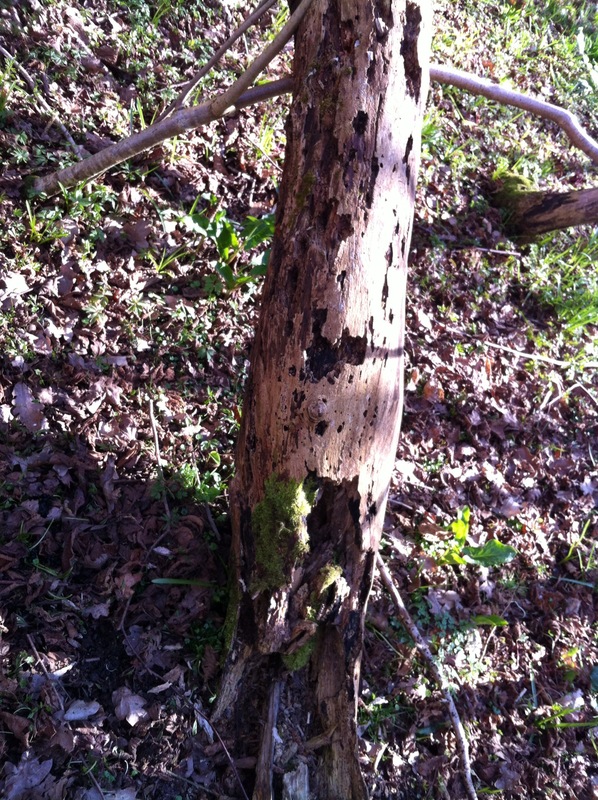 If a complete circle of bark and underlying tissue is removed the tree is said to have been ‘ring barked’ which prevents the movement of sugars around the tree and the section above the damaged tissue will die. This typically occurs between late April and the end of July and the damage observed during this walk was clearly caused in previous years. Heading a little further down the path, these bright young leaves caught my eye. 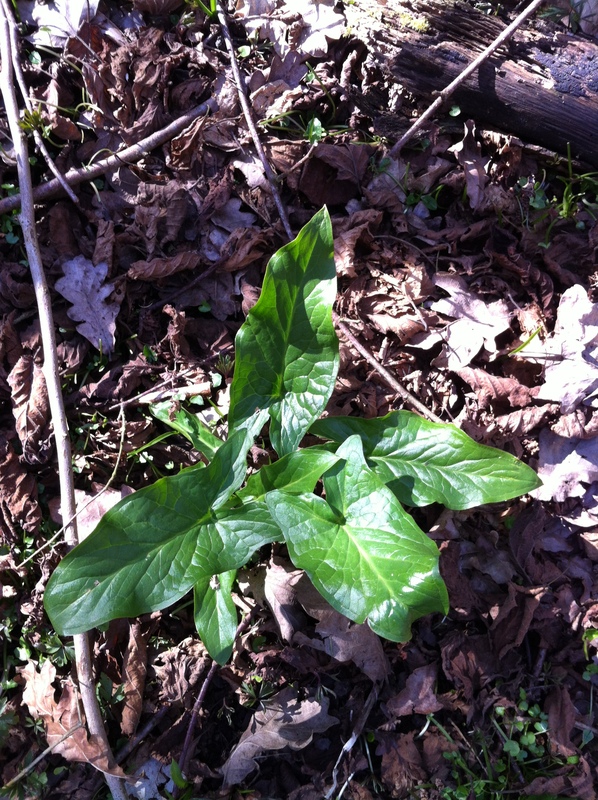 I am fairly sure they are Lords and Ladies (Arum maculatum), however my ground level vegetation identification is not my strong point! As the plants develop it will be clear whether my identification is correct or not! Walking out the other side of the woodland, some of the larger trees around the perimeter have a lot of holes. 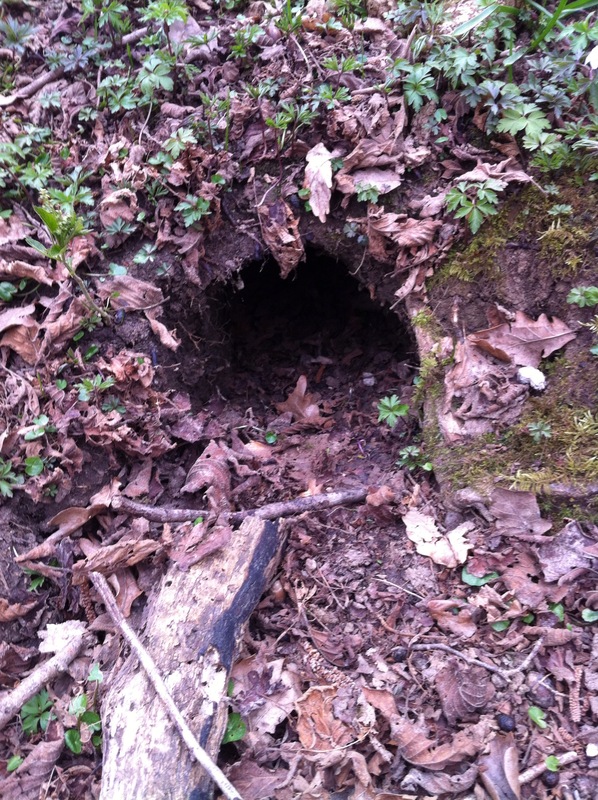 Many birds and mammals make and use holes in trees, especially in deadwood or weakened wood. It was impossible to see these holes clearly with the naked eye and my camera wasn’t strong enough to zoom in. I made a mental note to bring binoculars with me on future walks! For now, here’s the best picture I could get with my iphone camera! So that’s another week in the woods! Join us again next week for the latest developments. Lets hope this good weather holds and the trees can start to really get into spring! See you again next time for a walk in the woods! Remember to upload pictures of your own woodland walks to our facebook page – Treecreeper Arborists or email them to office@tree-creeper.com . Happy woodland walks!